Thanks to a recent client project I had the opportunity to get re-acquainted with a part of the technology industry that I had last worked in 12 years ago. I'm referring to technology reselling. This is where companies resell hardware and software (typically systems) to corporate customers. I learned something on this project and thought there could be value in sharing it. The diagram is to scale. The numbers of organizations decrease as you climb the triangle. Some say that the power resides at the top. Power in this case is - revenue, profit and account relationship. One thing for sure - there's a great view of the whole industry from the top. 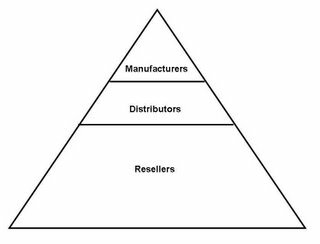 I'm certain that this market structure occurs in other industries. But what's interesting about Information Technology reselling is that the manufacturers and the distributors are essentially the same as years ago. Oh sure, Compaq became HP and IBM became Lenovo but the players are the same. Except the resellers. There has been about 95% turnover in this segment. Out of the hundreds of leading resellers that operate in Canada I can only recognize about 10. The reduction in IT spending, increased competition, declining margins are just some of the things that contributed to this churn in resellers. In my opinion the thing that underpins it all is the reduction in the commoditization of certain technology. Hand in hand with commoditization is the increase in knowledge and expertise of clients. With knowledge comes less dependence on advisors, also known as resellers in this discussion. As this happens company leaders tend to focus on the day to day survival measures and not enough time on re-positioning their business into higher growth areas where there is opportunity to do knowledge transfer with clients. Based upon the turnover in IT Resellers I imagine that this realization happened too late for most.